Alison's recent works are still life arrangements viewed from above, giving an emphasis to the elements of design and geometry. The organic objects - vegetables and fruit - with their intense colouring are juxtaposed against the steely blades of knives. Coupled with strong light and deep shadow, the result is an uneasy balance of simplicity, with a subtext of vulnerability and threat. 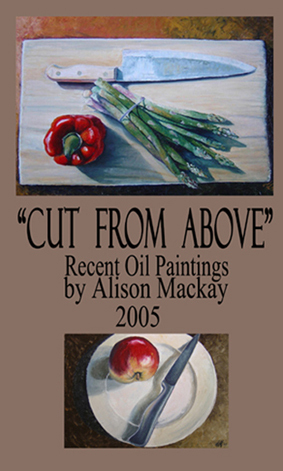 Alison's paintings focus on the beauty of everyday objects, their colour, texture and form.